Beloved priest: Fr Tom Keegan. 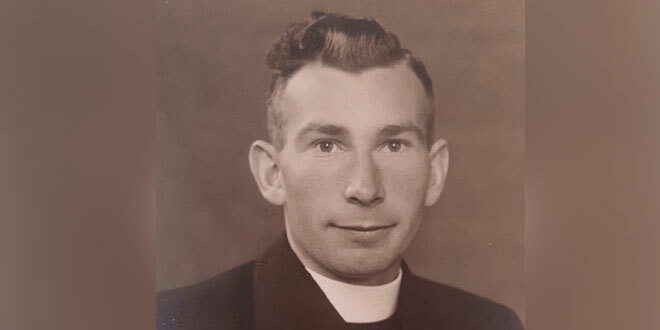 “THOUGH 12,000 miles (19,300km) may divide us my thoughts will constantly fly back to the old folks at home,” Fr Tom Keegan wrote in November 1953 aboard the ship Otranto while he was steaming out to Australia from his home in Ireland. 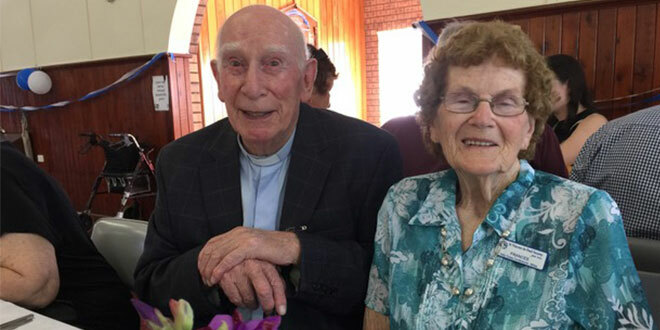 Memories from Fr Keegan’s life came back to life as his friends and family prepared for his 90th birthday on April 13. But one thing has been part of his life everlasting – family. Fr Keegan (pictured) came from a big family, who are known cheerfully by some parishioners as the “Holy Family”. “I have (a brother who is) a Christian Brother in Ireland and two sisters, nuns,” Fr Keegan, who is living in retirement in Toowoomba, said. One of his sisters was lucky enough to spend most of her time in Florence and Rome, Italy, but that life wasn’t for Fr Keegan; he was focused on one place at a time. “Whatever parish I went to, I stayed there; I didn’t gallivant, I stuck to my job,” he said. It was a job appreciated by his “mob”, as he called them, and what a job it was. “My first time being made a parish priest, the parish was twice the size of Ireland,” he said, talking about the Cunnamulla parish at the time. Since taking on the task, Fr Keegan has been a familiar face for more than 60 years. “It’s easy to get to know the mob,” he said. “Like most priests, I was sent around different parishes, and that’s the way I was able to get to know the whole Diocese of Toowoomba. Marriage, values and family were part of the culture of Irish Catholics he grew up in – especially family. 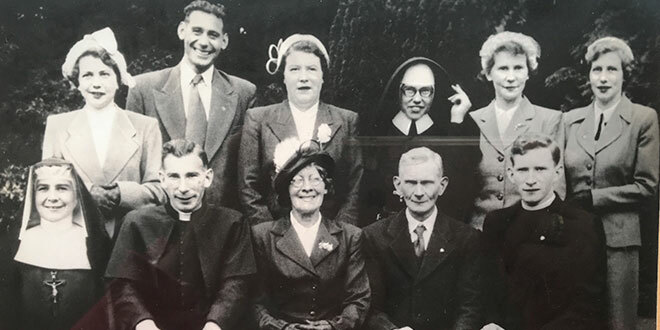 Family forever: Fr Tom Keegan (front second from left) with his family back in Ireland before he set off for Australia. It was the word that came up time and again talking to Fr Keegan’s friends. Family back home in Ireland, including some coming out to Australia for the event, have worked around the clock to put together a birthday Mass and celebration to remember. All sorts of tokens of the past, including photos of his ordination and his time in Ireland, are being sent out by family members to organisers in the Holy Name parish. Though one item of interest stands out from the rest, a diary Fr Keegan kept on his journey from Ireland to Australia – a piece of history. Complaints of 38-hour flights fall a bit short; Father Keegan left Ireland on November 25, 1953 to arrive in Adelaide on December 26. The adventure went on from there, detailing his travel all the way to Toowoomba. The summary words of the first sight of his new home were about the bus climbing in low gear and the revelation of Toowoomba – “A city seated on a mountain cannot be hid,” he wrote, taken from Matthew 5:14. It was there in that town on the hill that Fr Keegan would make his mark. He saw changes over the years, too – “everything”, as he put it. Fr Keegan recalled how he had gone from cameras to satellites, and even the advent of drones. It wasn’t just technology that changed but culture too, especially for a man who was raised in a deep-rooted Irish-Catholic culture. “That sort of culture is in danger of disappearing,” he said. He warned it was especially in danger in his homeland. But, despite the serious talks, he’s known for his jokes too. When asked about his birthday, Fr Keegan joked that he was much like the old man in the song My Grandfather’s Clock. Joy and good wishes have flowed to Fr Keegan and he’s asked for prayers from those who can spare them. Parish family: Fr Keegan sitting with a member of his parish community.